TeenLife Media, an online media company that offers comprehensive information and resources for parents, teens, and educators, recognizes the value of STEM education for students in its first-ever 2013 Guide to STEM Programs presented in partnership with STEMconnector®. Marie Schwartz, Founder of TeenLife Media comments, "With the fast pace of technology, it is no surprise that a solid foundation in STEM education (the common acronym used for Science, Technology, Engineering, and Mathematics) will provide today’s teens with an edge, and be more employable, in a wide range of exciting and lucrative careers in the future." "Parents and teenagers need to recognize that studying technology and engineering beyond a student's typical science and math classes is extremely valuable. STEM education teaches problem solving, teamwork, critical thinking and logic. These 21st century skills are transferable and applicable to any career path," continues Schwartz. Parents are not only encouraged to take an active role in promoting STEM education, but to also help debunk the stereotypes surrounding STEM: that only elite students with the best grades can succeed in STEM coursework; that a career in STEM means working alone in a white lab coat; or that studying STEM is only beneficial to those solely interested in those types of fields. Today's teens can use their STEM education like never before. From creative careers in video game design to becoming a baseball statistician like Bill James of the Red Sox, a career in STEM can be anything but monotonous. STEM-related careers can even have positive social effects on the community—such as environmental conservation efforts, energy efficiency, and cancer research. Julie Kantor, Chief Partnership Officer of STEMconnector adds, "It is also truly inspiring to see educators generating more interest in STEM by building a culture where being 'geeky' and smart is cool in school. Teachers are adding technology into the classroom, even starting tech clubs afterschool." President Obama has been very vocal that our national priority should be STEM education. Fifteen years ago, 40 percent of the world’s scientists and engineers resided in the U.S. and today that number has shrunk to about 15 percent. The U.S. Department of Commerce’s Economics and Statistics Administration (ESA) reported in 2011 that over the past 10 years, growth in STEM jobs was three times greater than that of non-STEM jobs. In addition, STEM workers were expected to earn 30 percent more than their non-STEM counterparts, and less likely to experience unemployment. 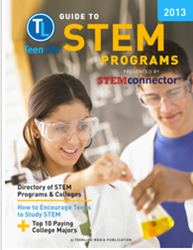 TeenLife Media's 2013 Guide to STEM Programs can be viewed online at http://www.TeenLife.com/STEM. TeenLife Media is the “go to” source for parents, educators, and teenagers nationwide that are seeking programs and services for college-bound students in grades 7-12. Our award-winning website, e-newsletters, specialized guides, parent magazine, and signature events feature thousands of enrichment opportunities that "bring out the best” in teenagers. These include summer programs, community service opportunities, academic experiences, and gap year programs—regionally, nationally and internationally. Access to all of TeenLife's resources is free for registered parents, educators and students. STEMconnector is a one-stop information source for STEM education and careers. Our directory at stemconnector.org provides a wealth of information for parents, corporations, K-12 leaders and more.